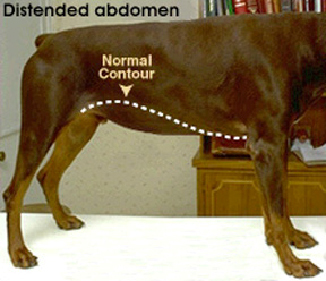 Testing for Abdominal Enlargement in dogs and cats. What might be the cause of abdominal enlargement? he causes of abdominal enlargement include an increase in intra-abdominal fat due to simple overall weight gain because of excess calories or insufficient exercise. A redistribution of fat into the abdominal cavity may occur with Cushing's disease. Dogs suffering from hypothyroidism often gain weight, as do some dogs with insulinomas (tumors of the insulin-producing cells of the pancreas). This weight gain may be perceived as abdominal enlargement. Fluid accumulation within the abdominal cavity, intra-abdominal tumors, and increased size of one or more abdominal organs may all give the physical impression of abdominal enlargement. Fluid accumulation may be the result of liver disease, cardiac disease, abdominal tumors, a certain viral disease in cats (FIP), or accumulation of urine in the abdomen. How do we determine the cause of abdominal enlargement in my pet? "A through history and physical examination will provide some 'clues' as to the underlying cause." Important historical clues include the recent development of any symptoms or clinical signs. For example, a middle-aged dog with weight gain and skin problems may be suffering from hypothyroidism (low thyroid hormone). A dog with a recent history of trauma may have abdominal enlargement due to urine leakage from a ruptured bladder, or from hemorrhage (bleeding) into the abdomen. Certain diseases such as Cushing's disease, hypothyroidism and insulinomas are commonly diagnosed in dogs, but not cats. The physical examination may allow us to detect accumulations of fluid within the abdomen as well as organ enlargement and tumors. If the cause is not evident following the physical examination, a series of screening tests including a complete blood count (CBC), a serum biochemistry profile, and a urinalysis, may help us to determine the cause of the intra-abdominal enlargement. Even if the underlying cause of the abdominal enlargement becomes evident during physical examination, for example if abdominal fluid accumulation is detected, these screening tests may help us to determine the underlying cause of this fluid accumulation. The CBC (complete blood count) provides us with an evaluation of the red blood cells, the white blood cells, and the platelet components of a blood sample. A numerical analysis of the cells is accompanied by a microscopic evaluation of a blood smear. Anemia is diagnosed by decreases in the red blood cell numbers, hemoglobin, and packed cell volume (PCV), of a sample. Mild anemia may be the consequence of any chronic disease including liver disease, and hypothyroidism. More severe anemia may be noted with hemorrhage into the abdominal cavity due to trauma or hemorrhage from an intra-abdominal tumor. 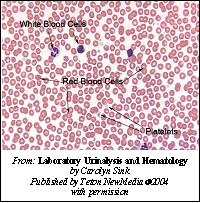 The underlying source of anemia can often be inferred by microscopic examination of the blood smear for specific changes in the red blood cells. Increases in the white blood cell numbers are suggestive of underlying inflammatory or infectious conditions such as inflammation associated with tumors and fluid accumulation. Cushing's disease often has an accompanying increase in white blood cells. "The serum biochemistry profile provides us with an evaluation of many organ systems..."
The serum biochemistry profile provides us with an evaluation of many organ systems including the liver, kidneys and pancreas. In addition to organ related enzymes, the biochemistry profile evaluates blood glucose (sugar), proteins, cholesterol and electrolytes. Increases in the liver related enzymes alanine aminotransferase (ALT), alkaline phosphatase (ALP), and gamma glutamyltransferase (GGT) are suggestive of underlying liver disease. Since Cushing's disease may also be accompanied by changes in these enzymes, it is important to determine if either disease may be present. Chronic, severe, liver disease is indicated by decreases in glucose, albumin (a blood protein) and urea without major changes in the liver related enzymes. Marked decreases in albumin may result in fluid accumulation in the abdomen (this is termed ascites). Increases in serum globulins (proteins produced primarily by cells of the immune system as a result of inflammation or infection) may be noted as a result of inflammatory, infectious, or neoplastic (literally new growth, and meaning cancer) conditions. The viral infection in cats known as FIP (feline infectious peritonitis) is an example of a disease that may cause increased levels of serum globulins. Underlying hypothyroidism seldom results in any significant biochemistry changes other than an increase in cholesterol concentration. A marked decrease in serum glucose (blood sugar) may be all that is noted with underlying insulinomas. 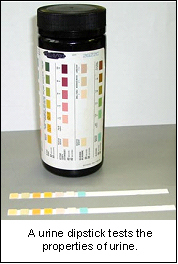 "A urinalysis is important in any sick animal..."
A urinalysis provides us with an evaluation of the chemical and physical properties of a urine sample. A urinalysis is important in any sick animal, and is necessary for the proper interpretation of any changes that might be noted on the biochemistry profile, especially if there are any increases in the kidney related values. 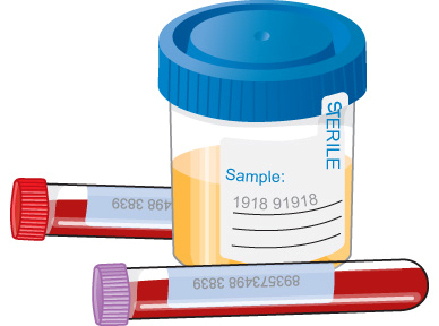 Inability to obtain a urine sample, in conjunction with a history of recent trauma, may raise our index of suspicion for bladder rupture or other urinary tract abnormalities. What other tests might be indicated for the evaluation of abdominal enlargement? Any additional testing depends entirely upon the combined results of the history, physical examination, and screening tests. It is impossible to list all possible additional tests. However, a few examples of common additional tests follow. Suspected Cushing's disease may be confirmed by dexamethasone suppression and/or ACTH stimulation tests. Suspected hypothyroidism may be confirmed by determination of serum thyroxine (total T4) concentrations. The confirmation of liver disease may include serum bile acid determination, imagining studies of the liver (ultrasound, x-rays), or biopsy. "If abdominal fluid, abdominal masses or enlarged organs are suspected, then imaging studies of the abdominal cavity are typically undertaken." If abdominal fluid, abdominal masses or enlarged organs are suspected, then imaging studies of the abdominal cavity are typically undertaken. 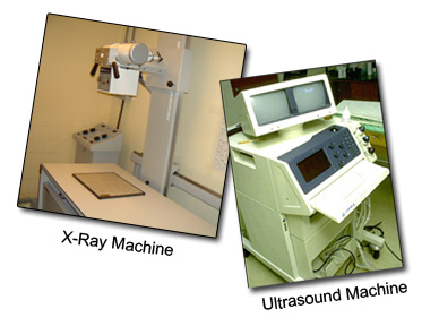 Such studies may include x-rays and/or ultrasound evaluation. 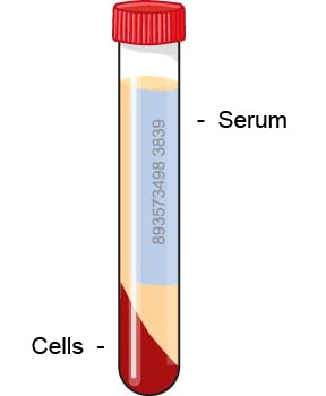 Fluid samples may be obtained by fine needle aspiration for analysis by a veterinary pathologist. The total protein content and cell types present in this fluid will help guide us to the likely underlying cause of its production. Similarly, masses or enlarged organs may be sampled by either fine needle aspiration biopsy or tissue biopsy in order to determine the cell types contained within and provide us with information regarding the prognosis and treatment options available. Depending on the imaging results, these biopsies may be performed under ultrasound guidance or by a surgical operation.